The Dawn Patrol is a 1930 American Pre-Code World War I film starring Richard Barthelmess and Douglas Fairbanks Jr. It was directed by Howard Hawks, a former World War I flight instructor, who even flew in the film as a German pilot in an uncredited role. The Dawn Patrol won the Academy Award for Best Story for John Monk Saunders. It was subsequently remade in 1938, with the same title, and the original was then renamed Flight Commander and released later as part of the Warner Bros. film catalog. During World War I, the pilots of an RFC squadron deal with the stress of combat primarily through nightly bouts of heavy drinking. The two aces of the squadron's "A Flight", Courtney (Richard Barthelmess) and Scott (Douglas Fairbanks Jr), have come to hate the commanding officer, Brand (Neil Hamilton), blaming him for sending new recruits directly into combat in inferior aircraft. Unknown to them, Brand has been arguing continually with higher command to allow practice time for the new pilots, but command is desperate to maintain air superiority and orders them into combat as soon as they arrive. Brand is so disliked by the two he cannot even easily join the men for the nightly partying, drinking alone and clearly breaking under the strain. The tension grows worse when an elite German squadron led by "von Richter" takes up position just across the front lines from them. After losing several of the squadron's veteran pilots, the ranks become increasingly made up of new recruits, who have absolutely no chance against the German veterans. Von Richter issues a taunt that Courtney and Scott answer by attacking the Germans' airdrome in defiance of orders from Brand not to go up against them. Brand gets revenge when he is recalled to headquarters and Courtney is made squadron commander. Courtney quickly learns the misery that Brand endured when four patrols a day are ordered and his pleas not to send green men ignored. Scott and Courtney have a falling out when Scott's younger brother is one of the new replacements and is immediately ordered on a mission. He is killed flying the Dawn Patrol. Brand returns with orders for what amounts to a suicide mission far behind enemy lines. Courtney is forbidden to fly the mission, so Scott angrily volunteers. Courtney gets him drunk and flies off in his stead. He shoots down von Richter returning from the successful mission but is killed by another German pilot. Scott becomes squadron commander and reads orders to his new replacements. Although Ronald Colman was originally to be cast as the lead actor in The Dawn Patrol, Richard Barthelmess was offered by the studio. Paramount Publix Corp. also loaned Actor Neil Hamilton and writer Seton I. Miller for the film. Principal photography began in February 1930 with exteriors shot at the Metropolitan Airport in Van Nuys, Newhall, and Sherwood Forrest in Southern California. In the midst of production, the studio was sued by Howard Hughes, through the Caddo Company and the Gainsborough Corporation. The suit alleged that The Dawn Patrol plagiarized his Hell's Angels (1930) production, also in production. The lawsuit resulted in The Dawn Patrol being rushed through post-production in order to be in theaters before Hughes' competing film. In late 1930, Warner Bros. won the suit, although a contentious issue arose when both Howard Hawks and John Monk Saunders claimed ownership of the original idea behind the film. [Note 1] Hawks claimed he based the film on his own recollections while Saunders insisted that the screenplay was derived from the interviews of other veterans of World War I.
Hawks attempted to create a realistic atmosphere, and assembled a variety of contemporary aircraft in a film squadron to shoot the flying scenes for The Dawn Patrol. He primarily used rebuilt Nieuport 28s as the aircraft for the British squadron, and Travel Air 4000s (reconfigured for films and popularly known as "Wichita Fokkers") for German fighters. Neither was truly representative of the 1915 era that was portrayed. Other aircraft in his small fleet included Standard J-1s for shots of entire squadrons, some of which were blown up in explosions, and Waterman–Boeing C biplanes for German aircraft destroyed in crashes. The scene in which Scott takes off with Courtney clinging to the wing, switches to a shot of a Travel Air 4U Speedwing fitted with a round cowl over its Comet engine to resemble the Nieuports. Stunt pilots included Leo Nomis, Rupert Symes Macalister, Frank Tomick and Roy Wilson. Several Thomas-Morse S-4 aircraft were used in the 1930 film. The S-4 was an American built fighter aircraft that did not see combat in World War I. Plentiful in 1930, the S-4s were becoming rare by the time the 1938 film was produced, hence the re-use of aircraft sequences from the original film. Some in-flight scenes with principal actors were staged with aircraft hoisted up by wires to a height of 25 feet. Stage hands then rocked the aircraft to simulate flight, but when one of the wires snapped, on screen, Barthelmess appeared startled, unaware that an accident had occurred, and simply thought the swaying aircraft was part of the scene. According to Warner Bros records the film earned $1,061,000 domestically and $563,00 foreign making it the studio's third biggest hit of the year after Gold Diggers of Broadway and Sally. Studio brass was extremely reluctant to back the release because Hawks had insisted on realistic dialogue that was at odds with the dramatic tone that executives had demanded. Nonetheless, The Dawn Patrol was an "instant success", one of the studio's most profitable films that year. Later critical reviews noted that the "anti-war" message was more prevalent in the original film, although due to the re-titling of Flight Commander, the film is often not as well known as its 1938 remake. The flying sequences, one of the hallmarks of the film, were vividly shot and were easily integrated into the later remake. 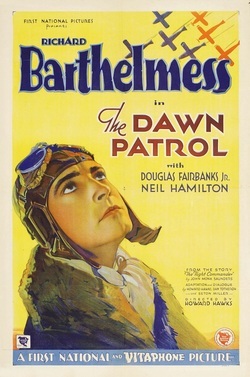 Despite the controversy over the origin of the screenplay for The Dawn Patrol, in 1931, Saunders won an Academy Award for Best Writing, Screenplay. The aerial sequences from The Dawn Patrol had a remarkably long lifespan, appearing not only in The Dawn Patrol (1938) but also in British Intelligence (1940). When the Warner Bros. film catalog was sold, The Dawn Patrol aired on television and from Associated Artists Productions, in its retitled form, as Flight Commander. The original title frames were discarded and the redrawn titles are on all known prints of the film. The film was remade in 1938 as a vehicle for Errol Flynn, replacing Barthelmess in the lead, rather than reissuing the original as planned. David Niven took Fairbanks, Jr.'s role and Basil Rathbone was cast in the role played by Neil Hamilton. Much of the flying sequences from the 1930 film, with several of the close-ups of the fighter aircraft, were re-edited verbatim into the 1938 movie, so as to save expense without having to search for or build new World War I era aircraft, but also due to the original sequences being expertly shot by Ernest Haller, his "cameraman of choice", brought in by Barthelmess. All of the film of the munitions depot explosions were also edited into the remake with no changes. When the 1938 version was released, the 1930 film was retitled Flight Commander, Saunder's original title for the project, to differentiate it from its 1938 remake. A novelization of the 1930 film, also titled The Dawn Patrol, was written by Guy Fowler and published by Grosset & Dunlap in 1930. Warner Bros. also released two Looney Tunes cartoons parodying this film. Bosko appeared in Dumb Patrol (1931) and 33 years later, in 1964, Bugs Bunny and Yosemite Sam appeared in a second cartoon spoof that was also called Dumb Patrol.. In the Netflix adaption of "A Series of Unfortunate Events", Violet states the 1938 remake as her favourite film. ^ The rivalry between Hughes and Zanuck was exemplified by Hughes buying up rights to available World War I-era aircraft to keep them out of Zanuck's hands. Hollywood legend has it that the two tycoons settled their differences over a game of golf. ^ a b c d e f g Smith, Richard Harland. "Articles." Turner Classic Movies. Retrieved: August 11, 2012. ^ a b "Notes." Turner Classic Movies. Retrieved: August 11, 2012. ^ McCarthy 2000, p. 104. ^ "The Plane." Archived 2009-04-22 at the Wayback Machine FlyWithTheBarnstormer.com. Retrieved: April 1, 2009. ^ "Le Wichita Fokker" (in French). Aeromovies - films d'aviation. Retrieved: April 1, 2009. This site includes numerous photographs of the type in film livery. ^ Farmer 1988, p. 76. ^ "Aviation Films - D." Aerofiles.com. Retrieved: April 1, 2009. ^ Pendo 1985, p. 100. ^ Pendo 1985, p. 101. ^ Howard, Ed. "The Dawn Patrol (1930) ." Only the Cinema, January 13, 2009. Retrieved: August 11, 2012. ^ Erickson, Hal. "The Dawn Patrol." The New York Times. Retrieved: August 11, 2012. ^ Harwick and Schnepf 1989, p. 56. ^ "Awards." Turner Classic Movies. Retrieved: August 11, 2012. ^ Evans 2000, p. 53. ^ Pendo 1985, p. 107. Farmer, James A. "Hollywood's World War One Aviation Films." Air Classics, Volume 24, no. 12, December 1988. Mayo, Mike. VideoHound's War Movies: Classic Conflict on Film. Detroit: Visible Ink Press, 1999. ISBN 1-57859-089-2. McCarthy, Todd. Howard Hawks: The Grey Fox of Hollywood. New York: Grove Press, 2000. ISBN 0-8021-3740-7.